Dr. Purcell is a board certified family physician holding medical licenses in South Carolina, Georgia and North Carolina. He completed his undergraduate studies at Armstrong State College in Savannah, GA before completing medical school in 1999 at Mercer University School of Medicine in Macon, Georgia. He came to Anderson to join AnMed Family Medicine Residency later that year. 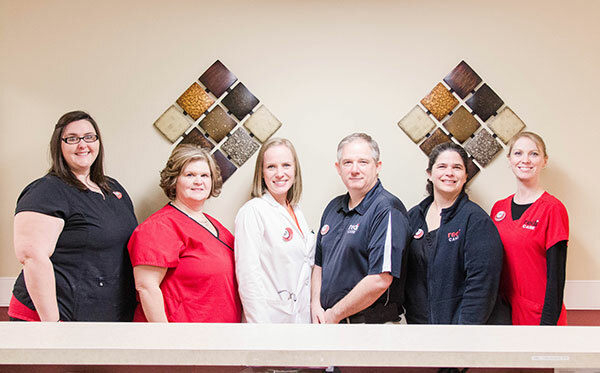 Dr. Purcell has been practicing family and urgent care medicine since completing residency in 2002. He started the RediCare walk in medical center in 2008 to offer affordable quality healthcare to the Westside of Anderson County. He is the sole owner and medical director of Redi Care as well as a certified Medical Review Officer and travel health specialist. He lives in Anderson with his wife and three sons and attends NewSpring Church. Lesley grew up in Westminster, SC and graduated in 2008 with a Bachelors of Science in Neuroscience from Furman University. In 2011, she received a Masters of Science in Physician Assistant Studies from the Medical University of South Carolina in Charleston, SC. She practiced in family medicine prior to joining the Redi Care team in November 2012. Lesley enjoys volunteering with Piedmont Womens Center and local missions. She lives with her husband in Greenville, SC.